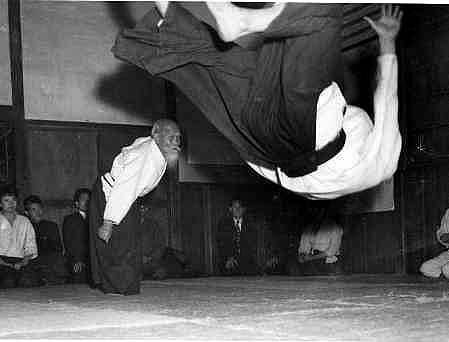 Aikido is the life’s work of its founder Morihei Ueshiba (1883-1969), known to Aikido students as O Sensei, or Great Teacher. A renown martial artist of his day who studied many different martial arts, O Sensei was also deeply interested in spiritual thought and disciplines. He came to understand the harmony and power of the creative process from which all things evolve. O Sensei was born December 14, 1883 in Tanabe, Japan, and according to his family records was a short, thin, and sickly child. As a young man he was a merchant, a soldier, and a farmer, but was always drawn to the martial arts. He trained continuously to discover the essence of Budo and became an extraordinary martial artist, mastering many of the traditional fighting arts of Japan, and blending this skill together with spiritual training. As a young man he studied Kito-Ryu and Yagyu-Ryu Jujutsu. When the Russo-Japanese war broke out, he achieved fame as a soldier for his skill with a bayonet. His bravery and sense of calm during his military service earned him the nickname of the “soldier kami” (soldier god). Just after the war, O Sensei studied Yagyu-Ryu swordsmanship. After returning home from the military, he studied Kodokan Judo. In 1915, he met a man who had a profound influence on his study of Budo, This man was Sokaku Takeda, master of the Daito-Ryu School of Aiki-Jujutsu. At their first meeting, even though O Sensei was the stronger of the two, he was thrown every time by Takeda Sensei’s superior technique. Since then O Sensei trained with Takeda Sensei at every opportunity. In 1919, O Sensei met Onisaburo Deguchi, the leader of the Omoto-Kyo Shinto sect. The spiritual teachings of this sect would influence the Founder in his spiritual thought. 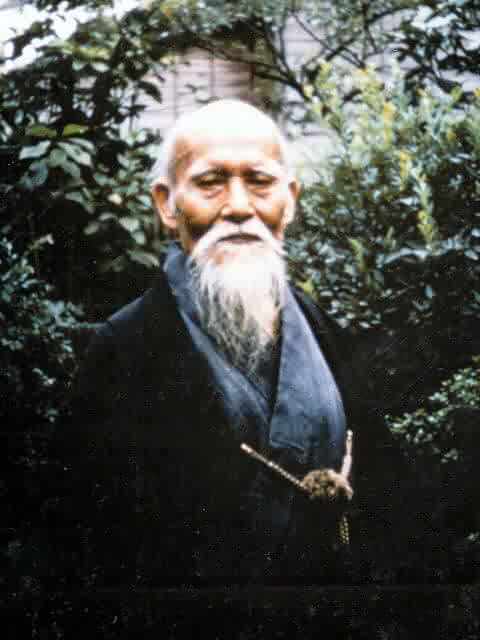 Deguchi encouraged O Sensei to make Budo his life’s work. Acting on this advice the Founder opened his own dojo, and in 1923 he officially named his art Aiki Bujutsu. Soon, his fame attracted national attention, with martial artists of all styles traveling to test his growing reputation as unbeatable. He defeated them one by one or sometimes in groups. No one could ever touch him. He seemed to disappear like smoke in their grasp. The founder of Kodokan Judo, Jigoro Kano, was dazzled by his skill, and referred to it as “my ideal in Budo.” The judo master requested that two of his major students be taken on as students of O Sensei. Many famous people, leaders in the government, military, martial artists and people in other fields studied with the O Sensei. Spiritual principles are embodied in the flowing movements of Aikido. Negative force is met not with conflict; rather, it is joined, controlled, and redirected. The practice and study of Aikido deepens our appreciation for nature’s balance and brings us back into harmony with the environment, with other people, and with ourselves. To train in Aikido is to challenge yourself, to face your fears and overcome your own aggressive instincts. Through serious Aikido training, negative fighting spirit becomes a creative martial spirit, one that can be examined and refined in an atmosphere of mutual respect. O Sensei founded Hombu Dojo, currently the World Headquaters of Aikido, in Tokyo, Japan, where one of his senior students was Mitsugi Saotome Sensei. After O Sensei’s passing Saotome Shihan came to United States to found the Aikido Schools of Ueshiba, an international association of dojos of which Cleveland Aikikai is a member.